Collectively, we, a group of students, faculty, staff and administrators at the University of North Carolina Greensboro, and members of the surrounding community, submit this nomination of Dr. Omar H. Ali, Professor of African American Diaspora Studies, for the College of Arts and Sciences Diversity Award. Through his selflessness and his ceaseless activity as an organizer, a leader, a friend, a colleague, and a teacher, moment by moment, he supports the development of all who are lucky enough to know him. For many of us, Professor Ali has not just made a difference in our lives, it has made the difference. You will hear this most eloquently in the words of those who need Professor Ali most, young people who, through his influence, have become empowered to create change in their own lives and who have become agents of change themselves. He encouraged me to take on roles that I never seem myself doing before. My entire attitude about life has changed since I met Dr. Ali. … He has given me so much inspiration in my life. He has encouraged me to grow and to keep growing, and plays a prominent role in why I am taking the steps to become an educator now. Dr. Ali supported me in navigating the emotional and institutional challenges of higher education… he gave me tools to not only empower myself but to support other men and women of color, particularly first-generation students. He teaches with energy, excitement, and compassion. He has an almost mythical ability to create an environment that is welcoming to people of all backgrounds. Through his playfulness, his absolute belief in the ability of others, and his wonderful listening skills, Dr. Ali masterfully helps you paint your aspirations onto you as if you were a canvas that with some shine could be something as beautiful as The Starry Night. Professor Ali’s contributions are a web of activities through which diversity and inclusiveness are the common threads. They include establishment of organizations such as Spectrum, UNCG (a group for young people on the autism spectrum), the Muslim Student Association, Community Play! 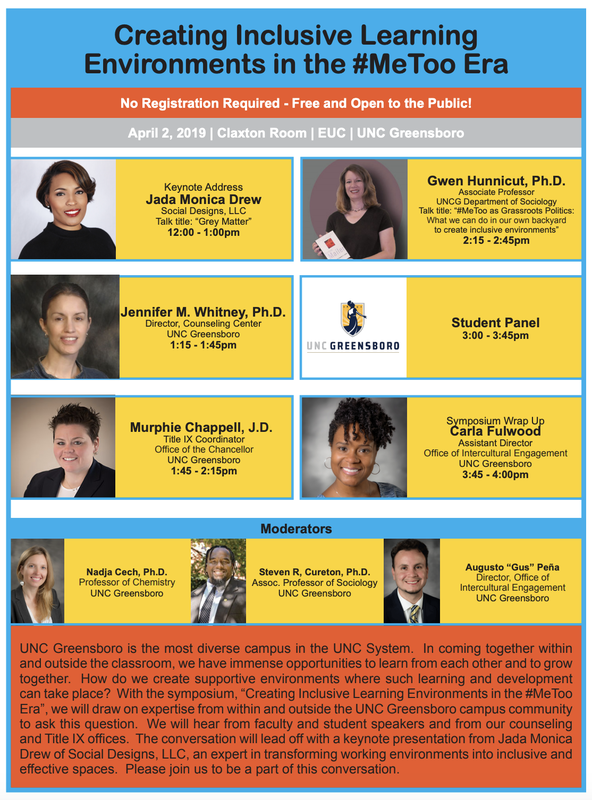 (which supports people in poor and working-class communities), and Bridging the Gap (a project that builds relationships between students and police officers on the UNCG campus). Professor Ali contributes tirelessly to initiatives in our community, for example the Crossroads program for high school students in a psychiatric hospital, and the inaugural Diversity Symposium with the US District Court. The impact of these activities is profound, unprecedented, and revolutionary. If ever there was a question that one person can change the world, here is the evidence. Nominations for 2019 will be collected in the Fall.